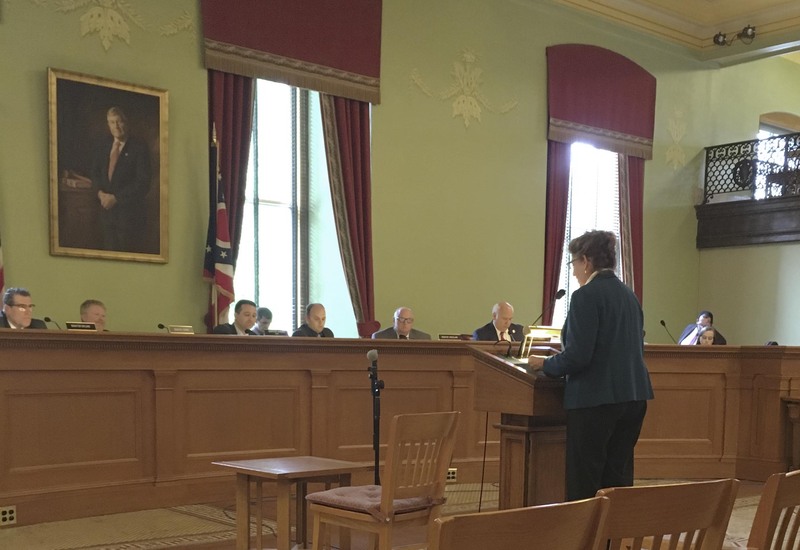 Kathy Hanratty testified Tuesday afternoon against the proposed language in the budget bill that would allow forced unitization for drilling and fracking of our local public parks, including county parks, to the Senate sub-committee on the budget bill in Columbus. She gave excellent testimony and it was well received. She was the 54th out of 57 speakers yesterday but spoke to an alert and respectful panel, including Senator Eklund and Senator Sean O’Brien from our area. Both Senator Eklund and O’Brien asked questions and made very positive comments to her, including “I admire your work and I am with you on this” from Senator Eklund. Most of the afternoon testimonies had not received questions from the panel so this was BIG. Kathy, Carol Gwirtz and I had an opportunity to visit offices of a number of local legislators and were positively received. The topic of the day was the gas/oil drilling issue, but we took the opportunity to talk to legislators and their aides about our opposition to the new Seitz HB218 about expansion of judicial powers over parks—now introduced as a stand alone bill. We felt that the goals and objectives of PGP are becoming known at the state level that will help us as we work towards working closely with elected officials in Columbus to impact legislative change regarding protection of parks and natural resources. Thank you to Kathy for such eloquent testimony and for speaking for Protect Geauga Parks.